Urolux Cleanser and Deodorant from HealthyKin.com is a concentrated solution specifically formulated to clean and deodorize rubber, latex or plastic urinary and ostomy appliances. Crystal build-ups are dissolved and unpleasant odors are eliminated. 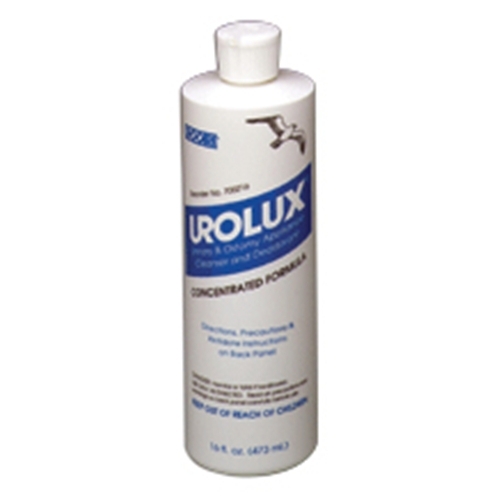 Urocare recommends the use of Urolux urinary and ostomy appliance cleanser and deodorant for cleaning latex or rubber urinary leg bags, Male urinal sheaths, night drain bottles, urinary drainage and extension tubing or any other reusable urinary or ostomy appliance. does the task it was supposed to do.